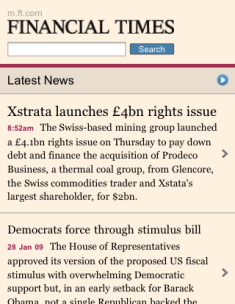 FT.com has been giving its mobile site a makeover, launching a new version which matches the pink look of the website, and has also been optimised for smartphone users. I looked at a few mobile newspaper sites recently, and haven’t been all that impressed so far, especially with those from UK publishers, so how well does FT.com translate to mobile? One mistake the FT mobile site avoids is the need for any kind of registration process as on Guardian mobile, or to send a text to receive a link to the mobile site, as with Times Mobile. All you need to do is visit m.FT.com. Some mobile best practice advice says that websites should detect these users and automatically divert them to the mobile version, as this saves them hunting around for the link, though users may appreciate having the choice. A clearer link to the mobile version from the standard website would be helpful though. The pink background has been carried over from the new FT.com website, and though the revamped site has been criticised for lack of contrast due to the colour of the background, it seems easy enough to read on a mobile screen. Lex column is out of bounds to non-subscribers. According to the press release, around 60% of the mobile site’s users have either Blackberrys or iPhones, so optimising for these devices is a smart move, and it does work well and looks good on an iPhone. Other UK news sites have not yet optimised for smartphones, and the look and feel of the Guardian and Times sites is way behind that of the new FT.com mobile site. FT.com also plans to introduce an iPhone app to further enhance the user experience on the site, which is a good idea considering the site’s audience. The New York Times has done this and it is the best way to view the site on mobile, providing better and quicker navigation than its already good mobile site. FT.com has produced the best mobile site I have seen of all the UK newspapers so far, the web version has been simplified effectively for the small screen; the site is easy to read and navigate, with a good range of news and content. 262966 spells A-M-A-Z-O-N on your dialpad. 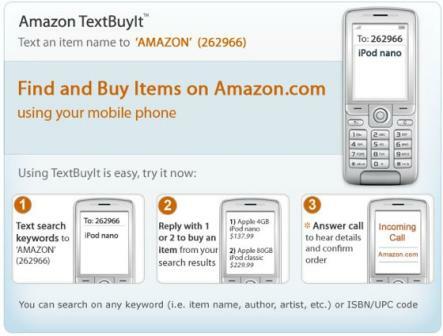 It’s the shortcode for TextBuyIt, the online retailer’s new SMS shopping system. Just type what you want – iPod Nano, for example, text it to that number and numbered search results appear on your handheld device’s screen. Respond with the number of the item you want, respond to the prompt for your email address and postal code, and you’ll get a call from Amazon to complete your purchase. It’s all so instantaneous, except for the waiting for it to arrive in the mail part. 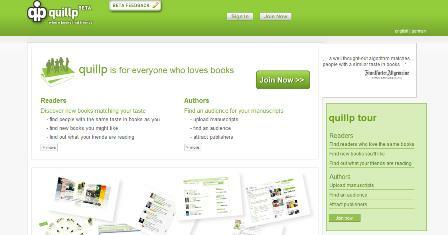 Quillp is a social network startup based in Germany which provides book recommendations for other readers based on similar tastes, as well as allowing budding authors to upload their own manuscripts for others to rate, review, and comment on. It has features in common with BookArmy and BookRabbit, as well as peer review sites for unpublished authors like Authonomy and YouWriteOn, so how does it compare?